A YEAR IN THE MERDE is the almost-true account of the author's adventures as an expat in Paris. Based loosely on his own experiences and with names changed to 'avoid embarrassment, possible legal action and to prevent the author's legs being broken by someone in a Yves Saint Laurent suit (or quite possibly, a Christian Dior skirt), ' A YEAR IN THE MERDE is the story of a Paul West, a 27-year-old Brit who is brought to Paris by a French company to open a chain of British 'tea rooms.' He soon becomes immersed in the contradictions of French culture: the French are not all cheese-eating surrender monkeys, though they do eat a lot of smelly cheese; they are still in shock at being stupid enough to sell Louisiana, thus losing the chance to make French the global language, while going on strike is the second national participation sport after pétanque. He also illuminates how to get the best out of the grumpiest Parisian waiter, how to survive a French business meeting, and how not to buy a house in the French countryside. 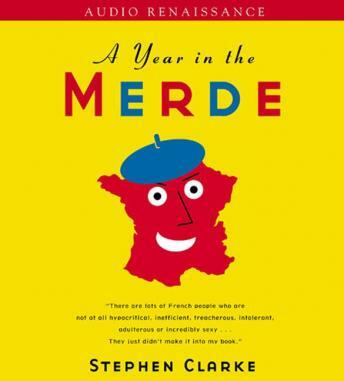 The author originally wrote A YEAR IN THE MERDE just for fun and self-published it in France in an English language edition. Weeks later, it had become a word-of-mouth hit for expats and the French alike, even outselling Bill Clinton's memoir at Paris's fabled American bookstore Brentano's. With translation rights now sold in eleven countries, Stephen Clarke is clearly a Bill Bryson (or a Peter Mayle...) for a whole new generation of readers who can never quite decide whether they love-or love to hate-the French.